What Can You Do with a Degree from an Online Community College? Are Online Community Colleges Affordable? Is an Online Community College Right For You? Students wanting to earn an associate degree are increasingly turning to online community colleges as a cost-effective, flexible option. During the 2015-16 academic school year, enrollment in online community college programs remained stable, even as enrollment in on-campus community college programs decreased for the fifth consecutive year. New, more affordable support technologies have significantly impacted this growth by allowing students to complete coursework from their smartphones and other devices anywhere and at any time. Rising education costs have also led more individuals to pursue an associate degree in an effort to minimize their tuition burden. If you have yet to enter higher education or are thinking of going back to school to start another career, an online associate degree may benefit you. Below, we have ranked the best online community colleges in the country and laid out the basics of what to know before you apply. With main campuses in Scooba and Mayhew, Mississippi, East Mississippi Community College serves students in six counties in Mississippi. As one of the nation's most affordable online community colleges, learners from around the world benefit from EMCC's extensive distance learning options. EMCC offers more than 450 online classes, many in cooperation with Mississippi Virtual Community College. The MSVCC, a consortium of 15 state community colleges, promotes access to educational materials to those unable to attend on-campus community colleges. EMCC is accredited by the Southern Association of Colleges and Schools Commission on Colleges, as are all the universities that offer online coursework through the MSVCC. Online classes offered through EMCC include accounting, biology, botany, criminal justice, and history. With EMCC's access to MSVCC resources, learners can study art, health promotions, and other topics otherwise unavailable to them electronically. Online students at EMCC can complete certificate programs and associate degrees in fine arts and the humanities, mathematics and science, and social science and business. Classes last eight or 15 weeks, depending on the field. EMCC provides free classes to learners interested in expanding their career options through the Adult Basic Education Launch Pad. Students can participate in high school equivalency and training programs designed to build and improve basic knowledge and skills. The school also offers a READI assessment for learners to check their competencies and abilities to complete online coursework. Through the tuition guarantee program, high school students in Lowndes, Oktibbeha, Clay, Noxubee, Kemper and Lauderdale counties can qualify for free EMCC tuition. Students must apply for federal and state aid and EMCC scholarships and grants, but if the balance of their tuition is not covered by these resources, the rest of their tuition costs may be waived. Founded in 1968, Laramie County Community College provides classes from campuses in Cheyenne and Laramie. LCCC also has outreach centers in Pine Bluffs and at F.E. Warren Air Force Base and offers fifteen online programs. LCCC offers online associate degrees in accounting, education, and government studies with additional offerings in career-focused fields like speech-language pathology. The online associate degree in speech-language pathology prepares students for the Speech-Language Pathology Assistant certification. Learners study with licensed speech pathologists as they complete a curriculum approved by the American Speech-Language-Hearing Association. Students who complete LCCC's online associate of arts degree in government studies develop critical thinking, writing, and research skills applicable to entry-level careers in government. Learners can also participate in the articulation agreement with the University of Wyoming and continue to a four-year degree. LCCC's affordable certificate programs complement degree offerings. Learners earn career-focused certificates in areas including medical office essentials and web development in less than 20 credit hours. An online certificate in business management entrepreneurship builds knowledge of small business practices and creation for students and business professionals through 28 credit hours of coursework. The Adult Career and Education System at LCCC, offered in cooperation with the state of Wyoming and the Wyoming Community College Commission, provides non-credit coursework to learners who want to build reading, writing, and math skills; pursue a high school equivalency program; or need assistance with college and career transitions. LCCC's online training program, offered in partnership with Ed2Go, provides six-week courses to build professional skills in areas such as computer applications, construction and trades, college readiness, and teacher professional development. LCCC is accredited by the Higher Learning Commission of the North Central Association of Colleges and Schools. Allen County Community College offers programs at its campus in Burlingame, Kansas, and online. Online programs at ACCC include general education associate degrees in areas including art, biology, and sociology. Students complete roughly 65 credit hours of foundational coursework and field-specific classes to prepare for entry-level positions or to advance to four-year degrees. ACCC has agreements in place for students who pursue bachelor's degrees: The online sociology program, for example, includes 65 credit hours that learners can apply to the 2+2 program in sociology at Kansas State University. Other ACCC programs transfer to KSU, including degrees in program management, criminal justice, and early childhood education. ACCC also offers certificates in career and technical fields like business, education, and allied health. Students can earn online certificates in early childhood education by completing 16 credit hours of classes in principles of education, child development, and instruction. Students also observe classroom settings and complete a professional portfolio. Online certificates in allied health include programs for nursing, home health, rehabilitation, and medication aids alongside offerings in medical office-related fields. Online students at ACCC have access to the school's on-campus resources. The ACCC library includes a large collection of electronic books, databases, and video materials. ACCC's writing lab also provides tutorial help and guidance on writing, research, and study skills. ACCC participates in the Midwestern State Authorization Reciprocity Agreement and is accredited by the Higher Learning Commission. Holmes Community College in Goodman, Mississippi, serves Attala, Carroll, Choctaw, Grenada, Holmes, Madison, Montgomery, Webster and Yazoo counties while offering online programming to students worldwide. HCC participates in the Mississippi Virtual Community College with thirteen other community colleges in Mississippi to offer convenient online coursework to individuals unable to attend classes on-campus. Classes taught through HCC include art, business, mathematics, and psychology, as well as the larger selection of classes the MSVCC provides. HCC students complete courses using the Canvas learning management system and have access to resources including the MSVCC library. Many of HCC's online classes include textbooks, lab resources, and course materials in the tuition, making the online community college even more affordable. Classes may include real-time sessions delivered through Community College Network, a two-way communication system that links community colleges throughout Mississippi. The CNN also links to junior colleges, two state universities, and K-12 schools in the state. Students interested in online classes and programs at HCC can use the assessment tool to gauge online learning capabilities and needs. HCC offers associate degrees that include 62 credit hours of coursework. Students complete 35 credit hours of general education classes before enrolling in field-specific courses. Students earn associate degrees in two years, while certificate programs provide one- and two-year options for students and working professionals. Career and technical certificates include mortuary science, forest technology, cosmetology, and welding and cutting technology. HCC also provides GED and adult learning programs to build career, computer, and supervisory skills. HCC is accredited by the Southern Association of Colleges and Schools Commission on Colleges. Out-of-state online learners should check for state authorizations prior to taking coursework through HCC and the MSVCC. As part of the Technical College System of Georgia, Albany Technical College awards certificates, diplomas, and associate degrees to more than 3,000 full-times students. An additional 2,500 learners complete classes part-time and through career development seminars, workshops, and professional trainings. ATC offers more than 30 online programs. Students can complete diploma programs in roughly 18 months in subjects including fire science technology, law enforcement technology, and marketing management. Certificates designed to enhance career and technical skills include three fire officer programs, specializations in supply chain and logistics management, and entrepreneurship. Certificate programs are comprised of 9-12 credit hours. ATC offers eight online associate of science degrees. Learners complete between 60 and 64 credit hours to earn two-year degrees in fields like business management, health information technology, and business administration technology. Online associate degrees in business fields prepare students for careers in customer service, administrative assistance, and clerical settings. Students can also continue to a four-year program with the skills they develop during the associate degree curriculum. ATC's online health information degree trains students to use, maintain, and analyze healthcare information systems and reports. Learners also gain insights into the complexities of the healthcare system in the U.S. and apply that knowledge to continued study in healthcare policy, healthcare administration, or the health sciences. ATC's online classes run parallel to on-campus classes. Students complete discussions, assignments, exams, and other activities using the Blackboard learning management system. Many of the degrees offered at ATC allow students to take classes online and on-campus, creating their own hybrid programs. ATC's health information technology program has been approved by the Commission on Accreditation for Health Informatics and Information Management Education (CAHIIM). ATC maintains accreditation through the Southern Association of Colleges and Schools Commission on Colleges. The Cochise County Community College District offers academic and career-focused programming from two campuses and five extension centers in Cochise County, Arizona. Founded in 1964, Cochise College was one of the first community colleges in the state and now offers courses to over 11,000 learners. Cochise offers online associate degrees in computer programming and intelligence operations studies. Intelligence operations students can concentrate on subspecialties like counterintelligence, imagery analysis, intelligence analysis, and military intelligence systems. Online students can earn a certificate in Linux system administration through 19 credit hours on programming, information systems, and computer scripting. Degrees that include two-year training differ from other associate programs that prepare students to transfer to a four-year program. Learners can earn online associate degrees in general studies, computer information systems, humanities, English, and economics in anticipation of transferring to one of the three four-year schools Cochise partners with for a seamless transition. Associate degrees require 60-64 credit hours of general education and field-specific coursework, taking two years to complete. Cochise has agreements in place with the University of Arizona, Arizona State University, and Northern Arizona University as part of its Transfer-Out Program. The program also allows students to transfer to several out-of-state schools, including Northcentral University in San Diego, California, and Ottawa University in Ottawa, Kansas, and online programs offered through schools like Purdue University Global and the University of Phoenix. Cochise also offers workforce training and professional certifications online through Ed2Go and U Got Class. Cochise College holds accreditation through the Higher Learning Commission. Hutchinson Community College in Hutchinson, Kansas, opened its doors in 1928. HCC offers affordable online community college coursework in more than 120 majors to over 5,000 students annually. HCC's online programs include associate of arts, sciences, and applied sciences degrees and certificate programs. Students earn certificates in areas including business technologies, office support, health coding, and paralegal studies. The certificate program in paralegal studies through HCC comprises 36 credit hours of coursework including classes in business law, legal ethics, and criminal law. Learners develop knowledge and skills applicable to the legal field and to working within a legal office. The online health coding certificate prepares students to work within hospitals, clinics, and insurance companies through coursework that can be applied to an associate degree in health information technology. Additional online associate degrees at HCC provide learners opportunities to enter careers in education, business, and criminal justice. An online associate degree in early childhood education includes 65 credit hours of classes on child development, curriculum building, and activity management as students train to work as teaching aids, nannies, and daycare providers. Students also complete an on-campus residency working in HCC's Child Care Center. The online associate degree in accounting prepares learners to continue onto a four-year program in the field with a 64-credit hour curriculum that incorporates mathematics, economics, and computer application technologies. HCC also offers online general studies associate degrees to provide broad coursework that transfers into four-year degrees. HCC uses the Canvas learning management system for online classes. HCC also offers extensive transfer resources, library access, proctor information, and information technology support to online learners. HCC is accredited by the Higher Learning Commission and has authorizations to deliver online classes across the country. Based in Riverton, Wyoming, with extension centers in Lander, Jackson, and Dubois, Central Wyoming College provides certificates, degrees, and courses in more than 36 areas. CWC's academic programs prepare learners for direct workforce entry or for bachelor's degrees, perhaps at one of CWC's transfer partners. CWC has field-specific and institution-wide transfer agreements in place. CWC offers an online electrical apprentice program. Students can complete the curriculum, grounded in the standards of National Center for Construction Education and Research, during the fall, spring, or summer terms. Online associate degrees at CWC include an interdisciplinary criminal justice program that incorporates classes in sociology, communications, law, and political science into its curriculum. Students can also complete an associate degree in business management to prepare for careers in business, government, or non-profit organizations. The meta major in social sciences offers students a wide range of classes in American Indian Studies, anthropology, economics, criminal justice, geography, history, homeland security, political science, psychology, religion, and sociology to gain knowledge across the social sciences. Students can also complete technical studies associate degrees in entrepreneurship and homeland security. Technical studies degrees combine certificate and field emphases to prepare learners for the workforce. Online learners at CWC have access to the school's library and other student services. Learners can access the information technology help desk and use CWC's testing center for exam proctoring services. CWC provides almost $1.5 million in scholarships annually. The affordable online community college also participates in the Western Undergraduate Exchange providing reduced tuition to learners in Alaska, Arizona, California, Colorado, Hawaii, Idaho, Montana, Nebraska, Nevada, New Mexico, North Dakota, Oregon, South Dakota, Utah, Washington, and Commonwealth of Northern Marianas Islands. CWC holds accreditation through the Higher Learning Commission. As one of the schools in the Technical College System of Georgia, Georgia Piedmont Technical College traces its origins to 1961. First known as the Dekalb Area Vocational School, GPTC provides programs to DeKalb, Newton, and Rockdale counties through ten educational centers. GPTC offers certificate and diploma programs alongside associate degree programs through its six schools. Learners complete diplomas in one year while certificates require less time. Students can earn associate degrees in two years. GPTC has more than 25 transfer agreements with four-year institutions to help students transition from an associate to a bachelor's degree with ease. Online offerings through GPTC include professional development programs. Students can enroll in more than 200 online training programs designed by industry professionals. Through Ed2Go, learners can complete business certificate and career training programs in areas such as business communications, business software, and sales and marketing; language and arts programs in graphic design and digital photography; and technology courses in networking, database management, and security. Writing and publishing programs online focus on business, creative, and grant writing while education programs emphasize classroom computing and teaching tools alongside subjects like math, science, and language. GPTC's partnership with Ed2Go also extends to professional training and licensure programs in hospitality, health and fitness, and information technology. GPTC also provides real estate courses and trainings online. Students can earn an initial real estate license or complete continuing education coursework. Distance learners may qualify for GED preparation and adult literacy classes as well. GPTC boasts a 73% graduation rate with 99% of graduates entering the workforce upon degree completion. GPTC is accredited by the Southern Association of Colleges and Schools, Commission on Colleges. Cowley County Community College, based in Arkansas City, Kansas, offers educational and career programs to more than 4,500 learners through its online college, two campuses, and extension centers. Cowley delivers online coursework using the Blackboard learning management system. Cowley offers more than 40 online associate degree and certificate programs. Learners can complete vocational certificates in business administration technology and specialize in legal office support, legal office administration, or general office support. Additional vocational certificates in medical coding, medical transcription, and medical office support prepare students for careers in the healthcare industry while the certificate in milling provides fundamental information for working within the milling industry. Students study the mathematics needed for the milling industry, equipment and technological aspects of milling, quality assurance and best practices for milling, and the practice of wheat production. Learners also complete an internship in the milling industry as part of the 29-credit hour program. Online associate degrees include leadership programs in healthcare, business, and emergency management systems. Students can also study history, religion, sociology, and social work or pursue a more niche degree like nondestructive testing. The nondestructive testing associate degree trains students in theories, methods, and practices of non-destructive testing as they prepare for the American Society of Nondestructive Testing exam. Learners develop knowledge and skills in industrial testing techniques such as X-ray, magnetic particle, and ultrasonic testing. Students who complete an online associate degree at Cowley can continue onto a four-year program, participating in one of the articulation agreements in place. Cowley has negotiated articulation agreements with schools around the country. The online college also provides learners access to Cowley's library, information technology resources, and student support services. Cowley College is accredited by the Higher Learning Commission and by the Kansas Board of Regents. Online programs are authorized in all 50 states. Cowley was the first community college in Kansas to receive membership in the State Authorization Reciprocity Agreement. Atlanta Technical College in Atlanta, Georgia, was founded in the aftermath of WWII as the Smith-Hughes Vocational School. Renamed and relocated several times during the second half of the 20th century, the school became ATC in 2000. Currently, ATC provides educational programs to 4,800 learners each term. Online learners at ATC complete courses using the Blackboard learning management system. Students can earn online associate degrees in accounting, business management, business administration technology, marketing management, or paralegal studies. The online associate degree in accounting includes 67 credit hours of coursework students complete in five semesters while students enrolled in the 69-credit hour paralegal studies degree finish the program in six semesters. Students can also earn online diplomas and technical certificates at ATC. Diplomas in management marketing, business technology, and accounting include four semesters of coursework. Learners complete online certificates in topics such as small business marketing, computerized accounting, and administrative support in two semesters. ATC offers hybrid classes to students as part of its online learning program. Learners at ATC can also access courses and programs offered through the Technical College System of Georgia. ATC provides valuable resources for online learners, including strategies for success in online courses and time management information. ATC offers continuing education programs in conjunction with Ed2Go and Gatlin Education Services (GES). Students complete courses and programs to build professional skills and pursue individual topics of interest. ATC's tuition-free programs provide opportunities to earn degrees in one of 48 designated fields. The HOPE Career Grant provides tuition assistance for programs in industries identified by Governor Deal's High-Demand Career initiative and the General Assembly as vital to the state of Georgia's economic success. ATC is accredited by the Southern Association of Colleges and Schools. Opened in 1968, State Fair Community College in Sedalia, Missouri, offers more than 260 online classes. SFCC has an enrollment of over 4,700 students. As one of the most affordable online community colleges in Missouri, SFCC supports continued education through articulation agreements, apprentice programs, and professional development opportunities. Online learners benefit from SFCC's extensive resources. Students can complete a quiz to determine readiness for online coursework and use the checklist provided to ensure hardware and software technical requirements. Online students have access to SFCC's information technology helpdesk, tips and guidelines for successful study, and Donald C. Proctor library. SFCC also provides Air Force personnel general education coursework online as part of the General Education Mobile (GEM) partnership. With the Community College of the Air Force, SFCC provides GEM students and all active-duty military personal, including Air Force Reservists and National Guard members, and spouses and dependents of active-duty military personnel discounted tuition and preferred registration. SFCC offers online certificate programs in nursing, including a professional certificate and a skills certificate for nursing aids. Additional certificates include those for pharmacy technicians and medical coding. The online certificate in medical assistance requires students to complete clinical hours, as do SFCC's online associate degrees in medical assistance, health information technology, and diagnostic medical sonography. SFCC's online associate of arts degree and the associate of science in business management can be completed entirely online. The associate of arts curriculum allows students to build their own programs based on their interests and goals. The flexibility and ability to specialize is ideal for learners who plan to continue to a bachelor's degree. Students complete 60-65 credit hours of coursework for all associate degrees at SFCC. SFCC holds accreditation through the Higher Learning Commission. North Dakota State College of Science, founded in 1903, remains one of the oldest two-year residential colleges in the country. NDSCS provides students with access to more than 80 certificate, diploma, and associate degree programs through two campuses in North Dakota: one in Fargo and one in Wahpeton. NDSCS offers online business programs in administration and finance, business technology management, and sales and hospitality marketing services. Students complete two-year associate degrees or third-year programs designed to supplement a career or technical degree. The third-year program in business technology management offers learners with plumbing, welding, or auto body technical training access, as well as the knowledge and skills applicable in entrepreneur and business contexts. Online programs in health information include a medical coding certificate and a health information technical degree. Learners can complete an online information technology degree in pharmacy technician studies or web design and development. NDSCS's online degrees in the liberal arts provide students with coursework to transfer to a four-year degree. The general technical studies program similarly allows students the flexibility to design their own interdisciplinary curriculums. The "journeyworker track" option within the technical studies program gives an accelerated degree path to learners with previous coursework, experience, and apprenticeships. The Division of Workforce Affairs at NDSCS offers online programs through Ed2Go and On-Demand Learning. Students complete coursework to build knowledge and competencies for their current profession or to advance within the workforce. NDSCS maintains articulation agreements with colleges and universities in North Dakota, Minnesota, and Montana to facilitate student transfers. Learners can access the agreements and work with their academic adviser on moving from a two-year to a four-year program. NDSCS holds accreditation through the Higher Learning Commission through the Academic Quality Improvement Program pathway. The Commission on Accreditation for Health Informatics and Information Management Education accredits their health information technician program and the pharmacy technician program holds joint accreditations through the American Society of Health System Pharmacists and Accreditation Council for Pharmacy Education. In 1959, the school's inaugural year, Western Wyoming Community College enrolled 40 full-time students. Currently, WWCC provides more than 6,500 learners with academic and career programs from its main campus in Rock Springs, Wyoming, as well as outreach centers, and through distance learning opportunities. The calendar for online coursework at WWCC corresponds to its on-campus classes. Students earn online associate degrees and certificate programs in disciplines including social work, sociology, accounting, and social science. Associate programs include 64-68 credits of coursework, while certificates range from 21-45 credits. Students can complete the college's online certificate in accounting in 12 months, and the online website development certificate lasts 18 months. WWCC partners with bachelor's and master's degree programs from around the country to provide courses to students. Through WyCLASS, WWCC students can enroll in distance learning classes from schools around the state. WyCLASS courses may utilize asynchronous or synchronous learning, and the classes could include interactive television and web conferencing. With Ed2Go, WWCC provides students, community members, and workforce professionals classes and programs to build career knowledge or to pursue a personal interest. WWCC provides extensive resources for its online learners. Students can access Hay Library, the WWCC learning center, the ACE IT advising center, and tutoring services. WWCC also offers tips and materials to help students access and use the Canvas learning management system. All online students can take an introduction to online learning course through WWCC, as well. WWCC has transfer agreements in place with several four-year colleges and universities. Their website provides links to schools, programs, transfer guidelines, and advising resources. WWCC received approval to offer online courses in 36 U.S. states through the State Authorization Reciprocity Agreement. WWCC holds accreditation through the Higher Learning Commission. Established by the Georgia General Assembly in 1986, Ogeechee Technical College (OTC) quickly expanded from nursing and continuing education programs to offer comprehensive certificates and associate degrees. Currently, OTC provides educational and career-focused programs to Bulloch, Evans, and Screven counties, as well as online. Students earn online certificates in technical fields, including computer security and network support, as well as business management areas such as leadership, supervisory management, and human resources. OTC's online certificate program in computed tomography prepares students to enter careers in tomography through coursework in radiologic imaging, equipment, and procedures. Learners enrolled in one of the college's online certificates in accounting develop skills and knowledge to work as payroll, office, and computer accounting specialists. They can complete certificate programs in 12-18 months. Associate programs at OTC provide students with two years of coursework to prepare for entry-level careers or continued study. Learners can earn online associate degrees in accounting, business technology, business management, criminal justice, or health information management in two years, and students can complete diploma programs in fields such as accounting, criminal justice, and business management technology in roughly two years, as well. Online continuing education programs at OTC, supported through Ed2Go, offer learners access to courses and programs for professional growth. OTC students have access to more than 80 courses. OTC offers online classes on the same schedule as on-campus courses, and students can complete guided coursework alongside their counterparts in the classroom. OTC also features hybrid classes for students who want to work on-campus and online alike. Online students at OTC have access to all student services available at the institution, such as the library, at which provides research assistance, eBooks, and writing support. Learners also receive technical support for using the Blackboard learning management system. OTC holds accreditation through the Southern Association of Colleges and Schools Commission on Colleges. Arkansas Northeastern College, based in Blytheville, Arkansas, offers non-credit, academic, and continuing education programs to learners throughout the state. Established when Cotton Boll Technical Institute and Mississippi County Community College merged in 2003, ATC's online programs include seven associate degrees in six disciplines. Students in the college's online associate degree in childhood education program can specialize in elementary or mid-level education. Both associate degrees include 61 credits of coursework to prepare learners for a bachelor's degree in the field. Students studying business at ATC complete 64 general education credits alongside business core courses in economics, accounting, and business communications. Full-time learners can complete their degrees in two years. Associate degrees in criminal justice and criminology with ATC include 60 credits. The online associate degree in criminal justice prepares students for entry-level careers in law enforcement, corrections, and criminal law. Their associate program in criminology combines coursework in criminology with a broad liberal arts curriculum, ideal for students who want to continue to a four-year program. The criminology program also provides students with the critical-thinking and analytical skills needed to pursue careers with federal law enforcement agencies. Any learner planning to go to law school or enter politics would thrive in this program. ATC offers two online degrees with flexible curricula, ideal for students planning to transfer to bachelor's programs. The associate of arts program includes 60 credits of general education coursework, while the associate degree in general studies allows learners to concentrate their studies in pre-allied health, fine and performing arts, humanities and social science, math and science, or computer technologies. ATC offers the lowest tuition in the state of Arkansas, with equally affordable online community college pricing. ATC holds accreditation through the Higher Learning Commission as a member of the North Central Association. Lenoir Community College in Kinston, North Carolina is one of almost 60 schools within the North Carolina Community College System. Chartered in 1958, LCC provides programs to Lenoir, Greene, and Jones counties, as well as through the Moodle learning management system online. LCC reaches more than 14,000 learners annually with its non-degree, certificate, diploma, and degree programs. Online certificates at LCC include offerings in small business accounting, marketing, and computer repair. LCC also offers unique certificates in private pilot essentials, aviation management, and unmanned aircraft systems. Aviation certificates include 12-14 credits in classes on aviation law, aircraft safety, and air travel operations. The community college also provides certificates in trucking operations and management. Additional diploma and certificate programs in global skills logistics prepare supply chain professionals for careers in business, management, and international operations through 12-44 credits. During the diploma program, learners also complete two work-based practical experiences to integrate classroom learning into a professional setting. Diplomas and certificates in trucking operations and trucking management similarly prepare students for careers in transportation, business, and fleet management. Associate programs at LCC offer online degrees in accounting, business management, and information technology. High school juniors and seniors can enroll in the college's Career and College Promise (CCP) associate degrees. CCP degrees constitute part of the LCC Guarantee to give early college coursework access to high-achieving students who plan to pursue bachelor's degrees. Online Career and College Promise degrees in nursing, the arts, and the sciences include 24-35 credits transferable to a four-year degree. Transfer students benefit from the comprehensive articulation agreement between the North Carolina Community College System and the University of North Carolina System. LCC also features bilateral agreements with specific bachelor's programs at institutions throughout the state. LCC holds accreditation through the Southern Association of Colleges and Schools Commission on Colleges. Tasked with providing workforce development programs to Banks, Barrow, Dawson, Forsyth, Hall, Jackson, and Lumpkin counties in Georgia, Lanier Technical College features associate degrees, diplomas, and technical certificates at its five campuses, as well as online. LTC offers 12 online certificates in career and technical fields, including firefighting, education, and computer applications. Certificates include 9-15 credits. The college's certificates for fire officers correspond with Georgia Fire Academy and Georgia Firefighter Standards and Training Council guidelines to prepare individuals for National Professional Qualifications exams. Fire administrators complete a certificate to build leadership and executive skills. Learners who want to work with children can complete certificates in early childhood education or infant and toddler childcare, as well. Business, computer application, and technical certificates provide students with advanced knowledge and skills in subjects such as accounting, Microsoft Office, and office management. Students who want to gain even more knowledge about a specific field can pursue diplomas and associate degrees. Diploma programs include 45-55 credits, while associate degree students complete 60 or more credits. Diploma curricula include fewer general education requirements and prepare students to enter the workforce, but associate degrees give learners a broader range of liberal arts and social science classes, often in anticipation of continuing to a four-year degree. Their diplomas and degrees in fire science and emergency management contain similar courses, but students can complete their diplomas in 18 months. Associate programs include two years of coursework. The interdisciplinary associate degree at LTC includes concentrations in dental hygiene, nursing, radiology, health information management, physical therapy, and surgical technology. The interdisciplinary program allows flexibility for each student interested in pursuing a bachelor's degree. Online students at LTC can assess their readiness to take online classes through the SmarterMeasure feature on the college's website. Online learners also receive access to Blackboard learning management system assistance, library resources, test proctoring, and GVTC, to explore the online programs offered through the Technical College System of Georgia. LTC maintains accreditation through the Commission on Colleges of the Southern Association of Colleges and Schools. The merger of Northeastern Nebraska College and Northeast Nebraska Technical College in 1973 created Northeast Nebraska Technical Community College, the institution that became Northeast Community College in 1991. From its main campus in Norfolk, Nebraska, NCC currently offers more than 80 programs, training modules, and concentrations of study. NCC offers six online certificate programs in career and technical areas, including business entrepreneurship and food service. Through 21 credits of coursework on business law, business planning, and accounting, students can develop the knowledge and skills needed to become business leaders. The food service certificate, which also includes fundamental information on dietary management, provides students 17 credits of classes on food safety, medical nutrition, diet therapy, and food service operations. Learners complete field work to gain real-world experience, as well. Students in the college's online diploma in business can earn the degree through full- or part-time study, completing 33 credits. Coursework includes business foundation classes in management, marketing, and salesmanship with electives in accounting, psychology, and economics. Learners can also complete a 63-credit associate degree in business, a curriculum that incorporates general studies classes and prepares students for bachelor's degrees in the field. In a collaborative effort with other community colleges in Nebraska, NCC offers an associate degree in early childhood development. Working childcare professionals may explore their eligibility for scholarships to complete the program. An additional collaboration with Central Community College, Northeast Community College, the Nebraska Library Commission, and the University of Nebraska at Omaha led to the school's online associate degree in library and information services. All partnership and collaborative degrees include 60 credits. NCC provides associate degrees specifically designed for transfer to a four-year program. Students can complete a transfer degree or an agriculture program before taking part in one of the many articulation agreements NCC has in place. Additional associate degrees in criminal justice, with concentrations in law enforcement, social sciences, general studies, and behavioral sciences similarly prepare students for bachelor's degrees. Online support programs at NCC provide learners with access to advising, career services, and their library. NCC offers an optional Coursework for Success program to orient students to online learning and holds accreditation through the Higher Learning Commission. When McCook Junior College, the state's oldest two-year college, North Platte Junior College, and Mid-Plains Vocational Technical School merged in the mid-1970s, they formed Mid-Plains Community College. MPCC serves 18 counties in Nebraska from main campuses in North Platte and McCook, with extension centers in Broken Bow, Valentine, Ogallala, and Imperial. With online offerings, MPCC provides more than 16,000 non-degree and degree-seeking learners programs each year. MPCC features online associate degrees in general studies, business administration, library studies, and criminal justice. Students enrolled in one of MPCC's on-campus programs can complete online coursework, as well. MPCC's online associate programs, designed to facilitate transfer to bachelor's programs, includes 60 credits of coursework. The Academic Transfer Program at MPCC maintains membership to the Nebraska Transfer Initiative, a cooperative agreement between Nebraska's public and private higher education institutions. The college offers extensive resources for its distance learners as one of the most affordable online community colleges in Nebraska. Before enrolling, students can complete online readiness surveys to gauge their capabilities. MPCC provides a detailed orientation for online students, as well. With downloads, student service information, and library access, online students at MPCC enjoy all of the benefits shared by their on-campus counterparts. MPCC has also partnered with business and industry leaders to provide online classes through the Business and Community Education department. MPCC offers access through Ed2Go, Gatlin Education Programs, U Got Class, and other online education delivery systems. Through the Center for Legal Studies, paralegals, lawyers, and other legal professionals can complete training courses in specific aspects of law, including nursing and engineering law. JER Online offers courses on writing, technical skill development, medical workforce training, and certificate programs. MPCC holds accreditation through the North Central Association of the Higher Learning Commission. Founded as Sunflower Junior College in 1926, Mississippi Delta Community College grew to an educational institution supported by and serving Sunflower, Leflore, Humphreys, Washington, Issaquena, Sharkey, Bolivar, and Coahoma counties. MDCC maintains accreditation through the Southern Association of Colleges and Schools Commission on Colleges and offers online academic coursework in disciplines including art, biology, English, and psychology. Technical classes online include allied health and business technology. In addition to online classes taught through MDCC, students can complete coursework via Mississippi Virtual Community College (MSVCC), a consortium of 15 community colleges in the state of Mississippi. The extensive list of classes provided through MSVCC provides convenient, flexible options for students who want to earn a degree in a field not available at MDCC. Classes offered by MSVCC last 8 or 15 weeks and many course exams require proctoring at MDCC. MDCC offers academic degrees in art, computer information systems, education, music, and the social sciences. Students can also enroll in MDCC's entertainment industry studies program, or the career and technical programming track, which includes certificates and associate degrees in fields such as welding, machine tool technology, masonry, and drafting and design. Certificates include 45-60 credits, while associate degrees require learners to complete 60 or more credits. Health science programs at MDCC include dental hygiene, phlebotomy, emergency medicine, and nursing. Learners can pursue associate degrees in nursing or complete healthcare assistance coursework. MDCC also offers an accelerated licensed practical nurse-to-associate degree in nursing program that includes 72 credits. MDCC uses the Canvas learning management system, and their website includes training and guides for learners new to the system. The school provides additional resources for online learners, including computer services, disability support, and library access. Wayne Community College in Goldsboro, North Carolina traces its origins to the Goldsboro Industrial Educational Center, founded in 1958. Officially named Wayne Community College in 1967, WCC provides educational programming to more than 11,500 learners each year. WCC maintains accreditation through the Southern Association of Colleges and Schools. WCC offers five online diplomas. Learners can complete coursework in business administration, information technology support, medical coding or transcription, and office administration in 12 months. WCC's 13 certificate programs provide shorter periods of study, with curricula students finishing their journeys in as few as eight months. Candidates can earn certificates in fields such as emergency management, database support, applied animal science, and bookkeeping. The associate of science degree at WCC allows students to concentrate their studies on criminal justice technology, information technology business support, operations management, and emergency management. Degree programs last two years and include roughly 60 credits. WCC's associate of arts degree, designed to ease transfer to a four-year program, includes four semesters of coursework that correspond to the first two years in a bachelor's program. Students can complete degrees with the intent of participating in one of WCC's articulation agreements or studying at an out-of-state school. Within the state of North Carolina, students enrolled in community college programs can transfer to one of sixteen universities as part of the Comprehensive Articulation Agreement. WCC provides students with a list of schools, websites, and other resources to assist in meeting transfer requirements and processes. WCC also participates in the Purple Promise, guaranteeing admission to nearby East Carolina University for its graduates and maintains transfer and tuition partnerships with the University of North Carolina Wilmington and Western Governors University. WCC's workforce development program offers online courses through Ed2Go. Adult learners and working professionals can choose from more than 200 courses, each of which lasts eight weeks. Courses include 12 quizzes and an exam. Established as Wyoming's first junior college in 1945, Casper College offers more than 140 academic programs to almost 3,800 full-time students. From its 200-acre campus in Casper, Wyoming, Casper College also offers online courses and degrees based in academic and career-technical learning. Students in Casper College's online certificate programs study management in office settings, hospitality and tourism, and retail and marketing. Learners can also earn certificates in fire science, gaining knowledge and skills applicable to professional firefighting. Students can complete certificates in roughly nine months. Casper College offers online associate degrees in 12 disciplines, including agri-business, health science, and pre-physical therapy. Agri-business students can complete associate of arts degrees or associate of applied science in the field. The former prepares learners to transfer to bachelor's degrees, while the latter emphasizes practical experience for students entering the workforce upon graduation. Health science associate degrees allow students to specialize in pre-pharmacy, pre-respiratory therapy, and pre-radiography studies. Additional pre-professional programs at Casper College include the pre-physical therapy associate of science degree. Through 60 credits, students prepare to enter bachelor's or professional degrees in the field. Casper College offers several hybrid programs, as well. Students complete 70% of coursework online or through distance learning. Hybrid degrees include aviation, animal science, construction management, and museum studies. Through Casper College's Distance Learning Center (DLC), students have access to resources about online study. The DLC offers technical assistance, Moodle learning management system help and support, and information about student services. Casper College participates in the Western Undergraduate Exchange (WUE), enabling residents of Alaska, Arizona, California, Colorado, Hawaii, Idaho, Montana, Nevada, New Mexico, North Dakota, Oregon, South Dakota, Utah, and Washington to attend at lower tuition rates. Nebraska residents can also enroll at Casper College and pay WUE rates. Casper College maintains accreditation through the Higher Learning Commission. Tulsa Community College serves more than 27,000 learners in the Tulsa metropolitan area and in northeastern Oklahoma. TCC students complete certificates and associate degrees alongside continuing education coursework. TCC offers online certificate and degrees through four schools and departments. Through the School of Business and Information Technology, learners earn six certificates in areas including accounting, business and business applications, income tax specialization, and payroll administration. TCC's School of Education offers a certificate in child development, ideal for individuals currently working with children who want to build child development competencies. Certificate programs require 18 to 27 hours of coursework. The School of Business and Information Technology offers associate degrees in business administration, information technology, management, marketing, and computer information systems, while TCC's School of Liberal Arts and Communication and Department of Mathematics and Science offer five additional two-year programs. Students earn associate degrees in history, psychology, education, mathematics, or general education through 60 credits of online coursework. TCC partners with Ed2Go to offer adult learners and working professionals online continuing education coursework. Students can enroll in hybrid and blended classes through TCC as well. Additional online resources include a self-assessment quiz to assess online learning readiness, student services, technical support, and library access. Online students must complete an orientation prior to enrolling in online classes at TCC. Tulsa Community College holds accreditation through the Higher Learning Commission and is a member of the American Association of Community Colleges. TCC also maintains authorization to award degrees through the Oklahoma State Regents for Higher Education. Founded in conjunction with Stone-Jackson Agricultural High School in 1925, Mississippi Gulf Coast Community College became a three-location educational institution in 1965. It soon extended its programs to 10 locations in the region. MGCCC offers two kinds of online classes. Programs offered through MGCCC, termed native, include only MGCCC students. Courses provided by the Mississippi Virtual Community College Consortium include students from community colleges throughout Mississippi. At MGCCC, students can complete online programs in business, American studies, or education, or pursue general degrees to prepare for transfer to a four-year institution. Online associate degrees of arts and sciences both have preparatory paths, ideal for learners who plan to earn a bachelor's degree after graduation. MGCCC provides an online textbook rental service for students enrolled in online classes. All online classes offered through MGCCC follow semester schedules and echo those of their on-campus counterparts. While students complete all coursework online, they may need to visit campus to complete an exam. MGCCC's assessment centers proctor exams for online learners. Online and hybrid learners at MGCCC can earn certificates and degrees in fields including agriculture, construction, manufacturing, and technology through coursework and apprenticeships that last one to four semesters. Business programs at MGCCC include degrees in business management technology, business marketing and management, and accounting technology. Some business degrees specialize in gaming to prepare learners for careers in the casino industry. STEM offerings at MGCCC provide opportunities to study computer network surveillance related to gaming or general computer, network, information, and database technologies. MGCCC is accredited by the Mississippi Commission on College Accreditation and by the Southern Association of Colleges and Schools Commission on Colleges. Established in 1926, Amarillo College expanded from arts and science offerings to additional vocational programs in 1942 and again during the 1960s. With six campuses and online coursework, Amarillo currently offers academic and career programs to more than 11,000 learners worldwide. Amarillo offers six online certificates including four in business management. A basic business management certificate includes 15 credits, preparing learners for entry-level business positions. The advanced business management certificate offers 30 credits and builds additional problem-solving and critical thinking skills. Students complete a certificate in mass media production in as few as 32 months or a certificate in mortuary science in three semesters. The mortuary science certificate includes interdisciplinary coursework in the sociology of death and dying, mortuary management, interpersonal communication, and funeral service practice. Learners at Amarillo can complete an online associate degree in mortuary science as well, with two years of coursework. Additional associate programs in business management, business administration, criminal justice, radiation therapy, and secondary education include 60 credits. Amarillo's online radiation technology degree follows a curriculum approved by the Joint Review Committee on Education in Radiologic Technology (JRCERT) to prepare learners for careers as registered radiologists. Through Ed2Go, Amarillo provides continuing education and workforce development classes online as well. Courses last six to eight weeks and include 12 lessons or 24 hours of instruction. In addition to being one of the most affordable online community colleges in Texas, the Amarillo College Foundation administers more than 700 scholarships. Online students have access to resources such as student services, counselling, tutoring assistance, and the Amarillo College Library. Amarillo College holds accreditation through the Southern Association of Colleges and Schools Commission on Colleges. Founded in 1957 in Los Altos Hills, California, Foothill College offers nearly 80 associate degrees and more than 100 certificate programs. Foothill also offers a bachelor's degree in dental hygiene. Foothill provides online coursework through the Canvas learning management system. Learners complete classes in accounting, allied health, library science, media studies, and sociology. Online associate degrees in 20 areas include 90 credits of general studies and field-specific coursework. Students can complete an associate degree in Japanese Studies, exploring the history, sociology, and culture of Japan and Japanese Americans. Learners also study the Japanese language. Foothill's online associate degree in Women's Studies includes interdisciplinary classes, incorporating art, communications, psychology, and sociology. Foothill offers degrees designed for students who plan to transfer to a four-year school within the California State University system. Learners can also earn a transfer degree in global studies, an interdisciplinary program that provides information about globalization and its effects on society, culture, and political structures. The online transfer program in social justice studies focuses on disparities around the globe and solutions for a more equitable society. Students who complete a transfer program at Foothill College receive preferred status when applying to one of the California State Universities. Online certificates at Foothill fall into several categories. Certificates of achievement include between 20-58 credits while certificates of proficiency range from 9-20 credits. Career certificates, skills certificates, and certificates of specialization also offer classes in niche fields for those who want to obtain advanced knowledge in specific areas. Foothill College is accredited by the Accrediting Commission for Community and Junior Colleges (ACCJC), Western Association of Schools and Colleges. Central Georgia Technical College in Warner Robins, Georgia, formed when Middle Georgia Technical College and Central Georgia Technical College consolidated in 2012. In addition to its main campus in Warner Robins, CGTC has 11 campuses throughout central Georgia. Online and hybrid instruction extends CGTC's educational offerings to learners worldwide. Online courses offered through CGTC include classes in computer technologies, business administration, and music. Students complete online programs at CGTC in cooperation with the Georgia Virtual Technical Connection. Learners have access to diplomas, certificates, and degrees in areas including banking and finance, accounting, and business management. Through GVTC, CGTC students can complete programs unavailable at Central Georgia. Drafting degrees, distribution management certificates, and a metrology diploma are a few of these options. CGTC offers continuing education and workforce trainings online each month. Students can participate in trainings in areas such as business, language arts, real estate, and writing and publishing through Ed2Go and JEROnline. CGTC helps students choose online coursework with assessment tools, technical readiness resources, and basic computer skills training. Students also complete an orientation for Blackboard learning management system. Learners may need to arrange exam proctoring through CGTC's student services. CGTC also offers several types of hybrid classes. Classes consisting mainly of online content are classified as K1 while classes with the majority of work in the classroom are K2. CGTC's Blendflex Program affords learners flexible attendance through video conferencing, online coursework, and recorded lectures. Students may also participate in telepresence coursework. CGTC is accredited by the Southern Association of Colleges and Schools Commission on Colleges. Central Georgia Technical College is authorized to provide online education to students who reside in 48 State Authorization Reciprocity Agreement member states. Eastern Wyoming College in Torrington, Wyoming, serves almost 8,000 learners through academic and community programs. Founded in 1948, EWC also sponsors outreach programs to residents of Converse, Crook, Niobrara, Platte, and Weston counties. The University of Wyoming maintains an outreach center on EWC's campus and, through common course numbering, articulation agreements, and transfer guides, EWC students can transfer with ease after completing an associate degree. Distance learning students at EWC benefit from extensive resources. Learners have access to student services, the library, tutoring and learning, and the bookstore. EWC also provides online students with information on its learning management system, CampusCruiser. Associate programs online at EWC include business administration, criminal justice, education, and interdisciplinary degrees. EWC's interdisciplinary associate degree of arts and associate degree of science prepare students to transfer to four-year programs by providing comprehensive general education classes. An early childhood education and elementary associate degree from EWC includes coursework from the first two years of a bachelor's degree in the discipline. EWC has 2+2 agreements in place to help students transfer upon completion. Certificate programs in education supplement online degrees. Students who want to gain competencies in childhood development complete 15 credits. EWC students can also take classes through WyClass, a collaborative effort among colleges and universities throughout Wyoming. Adult learners who complete 12 credits hours of on-campus coursework qualify to participate in distance learning opportunities as well. EWC is accredited by the North Central Association of the Higher Learning Commission. EWC participates in the Western Undergraduate Exchange program. Residents of Alaska, Arizona, California, Colorado, Hawaii, Idaho, Montana, Nebraska, Nevada, New Mexico, North Dakota, Oregon, South Dakota, Utah, Washington, Pacific Island U.S. territories (American Samoa, Northern Marianas, and Guam), and free-standing states (Marshall Islands, Federated States of Micronesia, and Palau), pay in-state tuition rates. Founded as the Winston-Salem/Forsyth County Industrial Education Center in 1960, Forsyth Technical Community College became part of the newly formed North Carolina Department of Community Colleges system three years later. Forsyth Tech acquired its current name in 1987 and currently provides for-credit programming to more than 11,000 learners from 10 campuses and centers. Forsyth offers 24 programs completely online, including several associate degrees designed to facilitate transfer to four-year programs. The associate of arts degree includes two years of humanities, social science, and fine arts coursework and is ideal for those who want to transfer to a business, education, sociology, or other non-scientific bachelor's degree. Forsyth's associate degrees in business administration, emergency management, project management technology, and criminal justice technology include coursework for students who plan to enter the workforce upon completion. Business administration students can specialize in general business, international business, logistics management, or import-export compliance. The emergency management associate program combines fire protection technology, criminal justice, and emergency medical science coursework to prepare learners for careers in law enforcement, emergency services, and government agencies. All associate degrees include 60-72 credits of coursework. Concentrated certificates in business administration include classes on human resources, global entrepreneurship, and customer service. Students can also earn certificates in project management technology and international business. Certificates in healthcare and in the health sciences include health services technology and two interventional cardiac and vascular certificates. Medical and health courses online further extend knowledge and skills in areas such as medical terminology, healthcare interpreting, and medical coding. Forsyth Technical Community College is accredited by the Southern Association of Colleges and Schools Commission on Colleges. Allied health programs hold accreditation through the Commission on Accreditation of Allied Health Education Programs (CAAHEP). Based in Rome, Georgia, Georgia Northwestern Technical College offers programs from six campuses and online. GNTC serves nine counties through more than 200 programs in business, health information, technology, and public service fields. GNTC offers five online associate of applied science degrees in business technology, business management, accounting, web development, and logistics and supply chain management. The logistics and supply chain management curriculum includes coursework in accounting, business principles, and economics to prepare students to work in procurement and to navigate issues of local, national, and global supply and transportation. The web development associate degree trains learners in computer concepts and terminology, program development and design, and computer networking. GNTC also has nine hybrid and blended programs that include more than 50% online content. Associate degrees include 60-64 credits. Online diplomas at GNTC mirror associate degrees, although with fewer credits for students who plan on entering the workforce immediately upon completion. In addition to diplomas in business, accounting, web development, and management, GNTC offers a 48-credit health information medical coding diploma. Students study medical terminology, diagnostic coding, and medical procedural coding in anticipation of the Certified Coding Associate (CCA) examination. GNTC also offers almost 30 career and technical certificates. Learners gain knowledge and skills in business, health, and technical subjects such as mammography, tax preparation, and Microsoft applications. Certificates require 12-30 credits. Students earning an online certificate or diploma can apply for financial assistance through the Helping Outstanding Pupils Educationally (HOPE) grant. The GNTC Foundation also offers scholarships to students in financial need. GNTC has articulation agreements in place with colleges and universities throughout Georgia and transfer agreements with the University of Georgia. GNTC is accredited by the Southern Association of Colleges and Schools Commission on Colleges. As one of two schools that make up the Northern Wyoming Community College District, Sheridan College provides educational programs to communities throughout the northern part of Wyoming. NWCCD serves more than 5,000 students through associate degrees and certificate programs. NWCCD's online certificates and associate of applied science degrees prepare students to enter the workforce or advance within their current professions. An online business certificate includes 30 credits of coursework in accounting, economics, and writing while the cybersecurity certificate requires 32 credits in computer network security, computer forensics, and scripted computer languages. Certificates in information technology support and early childhood education include 30 and 18 credits laying the foundations for careers in computer support and teaching, respectively. NWCCD offers an associate of applied science degree in computer networking administration to prepare students for careers within the information technology field. Learners complete 60 credits in network system set-up and maintenance, network devices and protocols, and troubleshooting problems related to the network environment. Applied science associate programs in education and business similarly provide foundational knowledge. Associate of arts and science degrees online include approximately 60 credits of general education classes to prepare students for a bachelor's program. Students can complete an associate of arts degree in history, English, social science, or general studies. Online associate of science degrees include science, education, cybersecurity, and general studies. Online learners can participate in online orientation, take part in the Student Help Zone, and access the library as they complete their coursework. Students also have access to courses and resources offered through WyClass. NWCCD colleges have been approved by Wyoming to participate in the National Council for State Authorization Reciprocity Agreements. The Northern Wyoming Community College District is accredited by the Higher Learning Commission. NWCCD participates in the Western Undergraduate Exchange (WUE) program. In 1961, Williston State College was established as the University of North Dakota - Williston. UND offered extension classes in Willison from 1957 forward and became an autonomous community college in 1999. WSC offers 12 distance learning degrees and certificate programs, including several bachelor's degrees through the Interactive Virtual Network (IVN). IVN allows students to communicate through two-way video technology as they complete classes. Online degrees through WSC include general associate of arts and associate of science degrees alongside specialized programs in business management and speech pathology. Students studying business management gain competencies applicable to industries including tourism and hospitality, healthcare information, and manufacturing. Learners complete 62 credits of coursework in accounting, economics, purchasing, and finance. The associate degree in speech language pathology prepares students to continue to a four-year degree in the field or to become a certified speech pathology paraprofessional. The paraprofessional curriculum leads to a Speech-Language Pathology Paraprofessional certificate in North Dakota. General studies associate degrees at WSC include 62 credits of interdisciplinary coursework. The online associate of arts curriculum integrates liberal arts, humanities, and social science classes while the associate of science program emphasizes mathematics, hard sciences, and computer science. Each program provides core knowledge easily transferred to a bachelor's program. WSC offers an online certificate in medical coding. Students study medical disorders and diagnoses while learning procedural and technological aspects of the field. Through 30 credits, learners gain information appropriate for the Certified Coding Associate (CCA) examination offered by the American Health Information Management Association. Online students at WSC receive information about using Blackboard, the learning management system, and access to the WSC library, learning commons, and Hippocampus, a library of over 5,000 digital learning objects. WSC maintains accreditation through the Higher Learning Commission of the North Central Association. Located in Albemarle, North Carolina, with an extension campus in Locust, North Carolina, Stanly Community College provides curriculum and continuing education programs to more than 5,000 students annually. Online degrees and certificates, delivered via the Canvas learning management system, include offerings in business, information technology, general studies, and health fields. Online certificate programs at SCC include information technology options in Microsoft and CISCO applications. Students can also complete a diploma in network security through 40 credits or an associate of applied science in the field through 70 credits. SCC also offers information technology business support specialty diplomas and degrees which emphasize accounting and technological support services. SCC's business administration program provides certificates, diplomas, and degrees for students to specialize in entrepreneurship or marketing. Learners can complete an online human services associate in applied science with 69 credits, while the accounting degree includes 70 credits of coursework. Educational programs at SCC offer students theoretical and practical knowledge to work with infants, toddlers, and school-aged children. Online certificates and diplomas establish fundamental skills for students who wish to work with young learners. Students can also complete non-licensure programs or associate degrees on-campus. SCC also has accreditation agreements with 12 public universities and three private schools for students to transfer into four-year degrees in early childhood education. Online associate of arts and associate of science general studies programs also prepare students to transfer to bachelor's programs. SCC participates in the Comprehensive Articulation Agreement, facilitating transfer of credits between North Carolina community colleges and universities. SCC is one of 58 schools in the North Carolina Community College System and is accredited by the Southern Association of Colleges and Schools. Maysville Community and Technical College, one of 16 schools within the Kentucky Community and Technical College System, offers educational programs from its main campus in Maysville, Kentucky. MCTC includes four campus in Maysville, Cynthiana, Mount Sterling, and Morehead, Kentucky. Students at MCTC can access online classes through KCTCS or through MCTC's direct offerings. The KCTCS online programs include certificate and degrees in business administration, computer information systems, criminal justice, marine technology, and medical information technology. The marine technology program builds skills for inland marine industry professionals. Degrees in marine engineering, marine culinary management, marine logistics operations, and wheelhouse management require 60-64 credits. Students can also earn associate of arts or associate of science degrees that include general education coursework transferable to a four-year program. Both degrees include 60 credits. KCTCS offers 11 online certificate programs for students at community colleges throughout Kentucky in areas such as financial perspective, team leadership, and small business management. Computer and information technology certificates cover subjects like Microsoft applications, computer security, CISCO networking, and web programming. Notable online programs at MCTC include the LPN-to-RN degree. The online LPN-to-RN program allows working professionals to take classes and participate in clinical exercises as they advance within their field. Students attend labs each Friday during the program. Upon completion, students take the National Council Licensure Examination (NCLEX-PN). The nursing program has been approved by the Kentucky Board of Nursing. As one of the most affordable online community colleges in Kentucky, MCTC offers a tuition guarantee. Students who meet criteria for the guarantee receive reimbursement for tuition expenses not covered by financial aid, college scholarships, waivers, or the Kentucky Educational Excellence Scholarship. Maysville Community and Technical College maintains accreditation through the Southern Association of Colleges and Schools Commission on Colleges. Pamlico Community College, founded as an industrial education center in 1962, provides cultural enrichment, continuing education, and academic programs to learners in eastern North Carolina. As part of the North Carolina Community College System, PCC participates in the Comprehensive Articulation Agreement with other colleges and universities in North Carolina. PCC also has a contract program with East Carolina University to provide easy transfers to appropriate bachelor's degrees, which includes the ECU Partnership-East program for education majors. PCC offers online classes in disciplines including accounting, chemistry, computer information technology, education, and health. PCC also offers hybrid options for learners. Online classes correspond to semester schedules. A notable offering through PCC includes the Electroneurodiagnostic Technology (EDT) program. A field that records and studies the brain and the nervous system, electroneurodiagnostics evaluates and researches overall nerve functions. An EDT degree at PCC includes 66 credits, including online coursework in instrument and record methods. PCC's hybrid early education program and the medical assisting degree include online and on-campus coursework, with students completing between 66-71 credits. Education classes online include foundations of education and health, safety, and nutrition. Students pursuing a medical assisting degree complete symptomatology, medical terminology, and medical transcription courses online. PCC provides online continuing education programs through Ed2Go. Online academic programs at PCC are offered via the Moodle learning management system. Students also have access to online tutoring, advising, library services, and the technical support center. Pamlico Community College is accredited by the Southern Association of Colleges and Schools Commission on Colleges and is a member of the National Council for State Authorization Reciprocity Agreements (NC-SARA). Founded in 1968, HTC exists as one of 16 institutions in the Kentucky Community and Technical College System. HTC educates students through online classes and at five campuses across the state. The school offers degrees and certificates in many technical fields, including agricultural technology, air conditioning technology, auto body repair, and computer-aided drafting. The college also instructs students in areas such as business administration, criminal justice, healthcare, and education. HTC offers online associate of arts and associate of science programs for students planning to earn a four-year degree. Through state articulation agreements, these degrees transfer easily to several public Kentucky institutions, including Eastern Kentucky University, Morehead State University, and the University of Louisville. Curricula include the 48 general education credits that all four-year Kentucky institutions require for graduation. Associate degree seekers complete coursework in areas such as writing, social interaction, mathematics, and oral communication. They also take 12 elective credits. Online learners can also choose from specialized associate of applied science programs in business administration, information technology, and criminal justice. Students enrolled in the medical or health information technology programs must find a local setting where they can complete practicum requirements. Additionally, the school offers online certificates in business administration systems and information technology. HTC offers two online learning formats. "Learn by Term" courses follow the traditional campus schedule and sometimes require onsite visits. Alternatively, "Learn on Demand" classes feature flexible start dates and a self-paced delivery format. Among the most affordable online community colleges in Kentucky, HTC boasts the state's lowest tuition. Out-of-state learners from counties that border Kentucky pay a lower tuition rate for on-campus classes than other out-of-state students. In addition, nonresident students taking online courses pay the in-state tuition rate. HTC holds regional accreditation from the Southern Association of Colleges and Schools Commission on Colleges. Surry Community College is a two-year comprehensive college situated by North Carolina's Blue Ridge Mountains. Founded in 1964, the school offers diplomas, certificates, and degrees across 48 areas of study. SCC offers eight online degrees. Students interested in business and management can pursue degrees in office administration, medical office administration, business administration, and finance. Alternatively, learners interested in technology can earn degrees in criminal justice technology and digital media technology. In addition, the school offers a general associate of arts degree and a degree in early childhood education. SCC's online associate degrees comprise 67-72 credits and take four semesters to complete. Students can also choose from several online certificates, including programs in early childhood administration and computer programming. Certificate seekers complete 16-18 credits and spend two semesters going through the curriculum. Distance learners can take both hybrid and fully online courses. Each online program follows the same curriculum as its on-campus counterpart. First-time online students learn to use the school's online learning platform through a mandatory orientation. Online students gain access to many of the same resources as on-campus learners. The school's academic support center offers individual and group tutoring along with writing help. Distance learners can also take advantage of academic advising services. One of the more affordable online community colleges, SCC's resident and nonresident online learners pay the same distance learning fee per credit. In addition, the school provides scholarships through the Surry Community College Foundation. Students can pay for school through a payment plan, submitting monthly installments. SCC holds regional accreditation from the Southern Association of Colleges and Schools Commission on Colleges, and North Carolina approves SCC to participate in the National Council for State Authorization Reciprocity Agreements (NC-SARA). As a member of NC-SARA, SCC can provide distance education to students in most U.S. states. Established in 1967, SCCC is a small institution based in Liberal, Kansas. The school offers dozens of programs to its more than 2,000 students. Learners can take courses on campus or online, and they can pursue associate of arts, associate of science, associate of applied science, and associate in general studies degrees. SCCC provides online learning opportunities through EDUKAN -- a cooperative between several western Kansas colleges. Using EDUKAN, students at participating institutions can take online courses at four colleges: Barton County Community College, Dodge City Community College, Pratt Community College, and SCCC. Students can choose from five online degrees at SCCC: associate of science degrees in biology, business administration, and chemistry; an associate of arts degree in liberal arts; and a degree in general studies. General education requirements vary by program, but most degree tracks require 32-34 general education credits. The associate of arts in liberal arts program requires 47 general education credits, including additional coursework in humanities, natural sciences, and social and behavioral sciences. To graduate from SCCC, students must complete at least 64 credits and maintain a minimum 2.0 GPA. Learners must also take at least 15 credits in residence. SCCC maintains articulation agreements that make it easy for students to transfer to four-year universities. SCCC partners with private institutions -- including Kansas Wesleyan University and Newman University -- as well as public schools, such as Wichita State University, Pittsburg State University, and the University of Kansas. EDUKAN enables students from across the U.S. to access cheap online community college courses. All EDUKAN students pay the same rate per credit, regardless of where they live. Students from 46 states participate in EDUKAN courses, and all member institutions hold approval through the National Council for State Authorization Reciprocity Agreements. Established in 1969, Roane State boasts a long history of distance education. In 1992, the school introduced its first live teleconferencing courses, becoming the state's first community college to do so. The college launched online courses in 1996, and Roane State currently offers several fully online programs along with more than 100 web-based courses. Students can choose from two online associate degrees: computer information technology and geographic information systems. Each degree comprises 63 credits and includes a four-credit directed research component. Students complete research requirements during their last summer and finish the curriculum in five terms. Online learners can also pursue certificates in computer information technology, geographic information systems, and healthcare documentation. Certificates comprise 21-32 credits and take 2-3 terms to complete. Roane State delivers web classes through Desire2Learn in a variety of formats. The college offers asynchronous courses, synchronous courses, hybrid classes, and web-enhanced classes. Students may participate in synchronous video conferences using software, such as Adobe Connect. The school hosts web-based student services that mirror on-campus resources. Roane State's online learning center offers web-based tutoring through Smarthinking. In addition, students can upload essays and receive feedback on their writing within 48 hours. Students at Roane State can also take online courses and pursue one of five degrees through the TN eCampus -- an initiative hosted by the Tennessee Board of Regents. Learners can pursue an associate of science or associate of arts in general studies. They can also earn an associate of applied science in criminal justice, early childhood education, or health information technology. 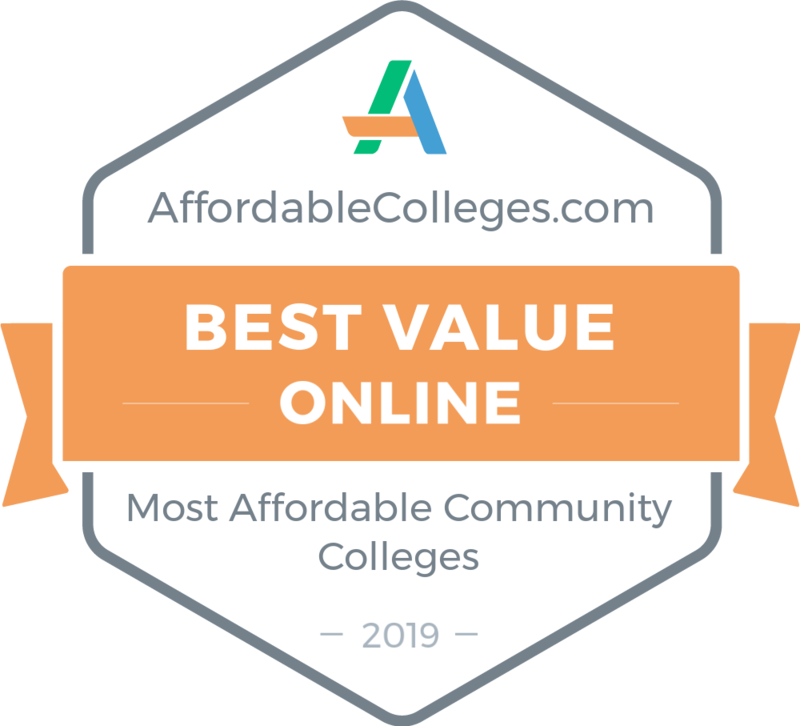 Ranking among the most affordable online community colleges, Roane State charges resident and nonresident online learners the same distance education fee per credit. Based in Paducah, WKCTC operates as one of 16 institutions in the Kentucky Community and Technical College System. WKCTC offers many areas of study, including automotive technology, collision repair, and welding technology. Students can also major in cosmetology, nursing, operations management, and education. WKCTC introduced its first online classes more than 20 years ago, and learners can earn many degrees by taking the school's online courses. The school offers all of its general education courses online. Additionally, through ed2go, WKCTC offers more than 300 open-access, non-credit online classes. Instructor-led courses include topics like web design, digital photography, grant writing, and foreign language. However, these continuing education courses do not lead to a certificate or diploma and do not qualify for financial aid. Online students gain access to the same resources as on-campus learners. For instance, students can contact the tutoring center and schedule an online tutoring session. Online learners can also take advantage of counseling, career services, and online library resources. WKCTC offers cheap online community college classes to students from Kentucky and around the nation. Online learners from Kentucky pay the lowest tuition rates, although out-of-state learners from counties that border Kentucky also receive tuition discounts. In addition, WKCTC offers merit-based and need-based scholarships to new students. Prospective students can apply to WKCTC for free. Applicants must submit an online application, high school transcript or GED certificate, and ACT or SAT scores. Applicants who scored below a certain benchmark on standardized tests must take placement tests, which help academic advisers recommend individualized paths of study. LRSC is a public, two-year institution based in Devils Lake, North Dakota. Founded in 1941, the college currently offers 15 associate degrees and many certificates and diplomas. Students can earn associate of arts, associate of science, and associate of applied science degrees online. LRSC offers an online associate of arts in business administration where students can select a concentration in accounting, management, or marketing. Alternatively, learners working toward a degree in early childhood education can finish and move on to a bachelor's program in just one year. The school also offers a web-based fitness trainer technician degree that prepares students for four-year degrees in kinesiology and related areas. This program -- an unusual option among affordable online community colleges -- includes coursework covering fitness assessment, injury prevention, and conditioning. The college also offers online associate programs in law enforcement and speech language pathology. All online students receive a dedicated adviser to help them make responsible academic decisions. In addition, distance students can access Smarthinking online tutoring, which provides academic help in subjects including English, writing, mathematics, business, and science. Online learners may submit questions to the writing lab and can expect a response within 24 hours. LRSC's online and on-campus programs hold accreditation from the Higher Learning Commission. Additionally, the school's fitness trainer technician program holds accreditation from the Commission on Accreditation of Allied Health Education Programs. LRSC is a member of the North Dakota University System and participates in the National Council for State Authorization Reciprocity Agreements. The school offers distance programs to students in all U.S. states except California. Online learners pay the same tuition rate regardless of where they live. To apply, prospective students must submit an application along with official transcripts from all institutions they previously attended. All incoming students must also take the ACT or ACCUPLACER test before enrolling in classes. CCC -- based in eastern New Mexico -- educates students across many fields, including graphic design, welding, and fine art. The college provides flexible distance programming in multiple delivery formats. Distance learners can complete coursework online, through two-way interactive television classes, or at Cannon Air Force Base. Online students can pursue eight degrees and certificates. Online degree options include programs in behavioral science, liberal arts, and business administration. The school also offers a 66-credit associate of applied science in legal studies that students can complete in five semesters. The legal studies program includes coursework in real estate law, legal writing, and criminal law. Students can also opt for an online associate degree in general studies. Distance learners can choose from several certificates that stand out among affordable online community colleges. For instance, the early childhood education certificate readies students to apply for the New Mexico Child Development Certificate. In addition, CCC offers nine computer information systems certificates, covering fields such as networking and game design. The college also provides non-credit online classes for professional and personal development. Continuing education courses feature an instructor-led format and six-week sessions. New courses begin each month through ed2go. CCC provides online versions of many of its on-campus resources. Through Brainfuse, distance students can access 24/7 online tutoring services, signing up for virtual sessions with professional tutors. In addition, CCC offers writing help to all students through its writing center. CCC provides cheap online community college classes to both in-state and out-of-state students. All students pay the same online course fees, regardless of where they live. In addition, the school provides numerous financial aid opportunities, including funding for childcare. EGCC, based in Ohio, operates campus locations in Steubenville and Youngstown. The school serves more than 4,000 students through programs dedicated to health, public services, technology, business, and education. Students pursuing associate degrees enjoy access to many online course options. EGCC also offers cheap online community college courses to non-degree seekers. In partnership with ed2go, EGCC provides online career training in a dozen fields, including information technology, hospitality, design, computer programming, and business. The school also offers many six-week classes that detail grant writing, digital photography, healthcare, and other areas. EGCC maintains articulation agreements with many four-year institutions, allowing students to easily pursue a bachelor's degree after spending two years at EGCC. The school maintains relationships with institutions including Bethany College, Kent State University, Youngstown State University, and Kaplan University. EGCC reviews applications on a rolling basis and admits new students throughout the year. The school recommends that applicants begin the application process at least 30 days before their intended start date. New students begin the process by submitting an admissions application, the Free Application for Federal Student Aid (FAFSA), and official high school or GED transcripts. New college students who have not taken the ACT or SAT must complete the ACCUPLACER placement exam. Before officially enrolling in classes, students meet with an enrollment specialist and attend a new student orientation. Some programs include additional admission requirements. In an effort to make tuition more affordable for low-income and high-achieving students, EGCC offers many scholarship opportunities. Students can apply for more than 30 merit-based and need-based institutional scholarships that award up to $2,000. The school awards aid to both full-time and part-time learners. Founded in 1925, NCMC is a two-year institution based in Trenton, Missouri. The college offers dozens of programs leading to associate degrees and certificates, including eight fully online programs. In addition, all students can complete general education requirements online. Students interested in business can pursue a certificate in business essentials or an associate of applied science in business and technology. Other certificate options include programs in accounting and financial management. Certificate tracks feature 15-30 credits and take one year or less to complete. Degree seekers can also pursue associate of applied science programs in behavioral health support, criminal justice, early childhood development, and nursing. Each program requires 60-65 credits and takes two years to finish. As part of their associate coursework, students complete around 15 general education credits. Online learners can take advantage of many of the same resources as on-campus students. The school hosts online academic tutoring and an online writing lab. Students can upload an assignment to the writing center to receive feedback within 48 hours. The writing lab also features numerous online resources that cover grammar, common errors, and writing tips. The career services department offers resume help, mock interviews, and job search assistance. Ranking among the country's most affordable online community colleges, NCMC gives tuition discounts to out-of-state students who enroll in web-based courses. While nonresident online students pay more than in-state students, they pay less than nonresidents who study on campus. Online nursing courses cost more per credit than other distance classes. The college offers several institutional scholarships, including merit-based and need-based awards. First-time freshmen must submit an application along with official high school transcripts or GED certificates. They must also provide ACT scores or previous placement exam results. Applicants with math scores older than three years must sit for a placement exam. RCC operates as a two-year institution out of Hamlet, North Carolina. The college offers 34 academic programs spanning fields such as business, engineering, health sciences, and public services. In addition, the school offers vocational programs in areas like welding, engine repair, and industrial maintenance. RCC hosts many hybrid, online, and web-enhanced courses, allowing students to complete several programs entirely online. Notably, the college offers two online information technology tracks in cybersecurity and software development. Other online degrees include associate of applied science options in business administration, criminal justice technology, healthcare management technology, and finance. The school's online early childhood education degree requires 65-71 credits and boasts a non-licensure track and a licensure option. Associate programs require students to complete general education courses in writing, public speaking, mathematics, humanities, and behavioral sciences. The online associate of arts program serves students planning to transfer to a four-year institution. Learners explore general education subjects such as English composition, communications, fine arts, and natural sciences. They also take 14 credits of pre-major or elective courses. Thanks to RCC's many transfer agreements, associate students can easily apply their credits to a bachelor's program elsewhere. Some agreements help associate degree holders earn specific bachelor's degrees. For instance, graduates of RCC's associate of arts programs can choose to enter the bachelor of science program in elementary education at Gardner Webb University. In addition, through the North Carolina Comprehensive Articulation Agreement, students who graduate from RCC with at least a 2.0 GPA can easily enroll in one of the 16 University of North Carolina System schools. RCC prides itself on being one of the most affordable online community colleges in North Carolina. The school offers more than 100 scholarships each year through the Richmond Community College Foundation. As an example, students can apply for the Working Student Scholarship, which provides aid to students who work more than 10 hours per week. WVC -- a member of the California Community College System -- serves more than 8,000 students annually through degree, vocational, and certificate programs. Students can pursue more than 50 associate degrees and more than 90 certificates across a variety of fields. WVC distance learners can select from hybrid and fully online courses. The school provides general education and major-specific classes in a web-based format. Many courses use the Canvas learning management system, although some use other delivery methods. Students can enroll in online courses covering accounting, communications, economics, history, and politics, among other fields. Some notable online classes include environmental biology, social media marketing, and history of rock and roll music. The school also offers several online courses in real estate, including property management, real estate investment, and legal aspects of real estate. Students should expect to spend 6-9 hours per week on each three-credit course. Semesters last 16 weeks, although students may complete some courses in shorter, more intense sessions. While WVC delivers online courses asynchronously, most courses require occasional participation in online discussion forums. Many WVC students move on to a four-year program after earning an associate degree. Students who satisfactorily complete the school's associate degree for transfer qualify for guaranteed admission at a school in the California State University System. In addition, six University of California institutions guarantee admission to community college students who meet certain GPA, credit, and coursework requirements. WVC also maintains an articulation agreement with the University of Hawaii at Manoa. WVC provides cheap online community college courses by offering students many financial aid opportunities. Each year, the West Valley College Scholarship Program awards around 200 scholarships ranging in value from $200-$3,000. Prospective students must submit an online application. Additionally, all new students must take placement assessments in English, writing, reading, and mathematics. A member of the Technical College System of Georgia, Wiregrass offers more than 140 programs of study. The school serves about 6,000 students at several campus locations and through distance courses. Online learners can earn fully online associate degrees in business technology, accounting, and business management. Each program requires 63-64 credits, including 15 credits of general core courses. To complete general education requirements, students choose classes in subject areas like communication, social science, fine arts, and humanities. The business management degree boasts five specializations, including human resources management, service sector management, and logistics. Non-degree seekers can pursue diplomas in accounting, business management, and business technology. Diplomas comprise 42-50 credits, including eight credits of general core courses. General education courses explore English, mathematics, and psychology. Wiregrass offers distance education courses in three delivery formats: online, hybrid, and web-enhanced. Each online class runs approximately 15 weeks and requires 8-10 hours of study each week. While many professors ask students to follow a strict week-by-week schedule, some instructors let online learners work ahead. The college delivers all distance courses asynchronously through Blackboard, though some courses may require students to occasionally visit campus. New online students learn to use Blackboard through an orientation program. Learners can apply for more than 20 scholarships from the Wiregrass Foundations, making the school one of the most affordable online community colleges. Some scholarships serve all majors, while others target students in specific programs. Individuals must submit most scholarship applications at least two weeks prior to the start of classes. New students must submit an online application along with proof of secondary education. Students may also need to take the ACCUPLACER exam; however, individuals who have completed other standardized tests, achieved a minimum 2.6 high school GPA, or earned a previous associate degree need not take placement exams. Founded in 1858 as Highland University, HCC is the oldest college in Kansas. Today, the school serves serves around 2,700 students at 33 regional locations and through HCC Online. The college boasts 50 associate concentrations and 15 technical education programs. Students at HCC can complete individual courses, general education requirements, and entire degree tracks online. Degree seekers can choose from five associate of applied science options as well as an associate of science, an associate of arts, and an associate in general studies. The school boasts a few unusual programs, such as its associate of applied science in medical coding, which covers topics such as medical terminology, disease classification, and pathopharmacology. Online learners can also pursue an associate of applied science in personal fitness training, which teaches concepts related to nutrition, anatomy, and physiology. All of HCC's online associate degrees feature 63 credits, except for the medical coding program which comprises 64 credits. HCC holds transfer articulation agreements with several institutions, including Baker University, Donnelly College, and Kansas Wesleyan University. In addition, through an initiative supported by the Kansas Board of Regents, students who earn an associate of arts or associate of science at HCC can enter a Kansas public university as a junior. Both in-state and out-of-state students can take advantage of HCC's cheap online community college classes. All online learners pay the same tuition and fees, regardless of where they live. In addition, students can pay their tuition through HCC's payment plans. To apply, prospective students must submit an admission application along with high school or GED transcripts. Students may submit ACT or SAT scores or they can take a placement exam. Transfer students must meet the same admission expectations as new students. Transfer students can transfer up to 47 credits toward an HCC degree, although they must complete at least 16 credits at HCC. Offering just five programs, Southeast Technical Institute in Sioux Falls, South Dakota opened its doors in 1968. Currently, Southeast Tech offers almost 70 programs that learners can complete in 24 months or less. Southeast Tech features 13 associate degrees. The business administration program at the school allows learners to focus on general administration or human resources, while the financial services degree emphasizes banking or insurance. Three marketing degrees include specialized curricula in general marketing, design, and sales. Programs vary from 66-68 credits. Learners can also pursue online associate degrees in entrepreneurship, accounting, and office assistance services. Southeast Tech's healthcare leadership associate program includes 65 credits of coursework to prepare professionals for executive roles in the field. The computer programming degree trains learners to use software applications while teaching programming languages, building critical-thinking skills applicable to software development, and competencies to apply development tools in appropriate situations. Southeast Tech's accounting degree, recognized as one of the most affordable online community college programs in the state, prepares students to gather and analyze financial information, perform audits, prepare taxes, and maintain budgets. Southeast Tech's associate programs offer career and technical skills while setting the foundations for earning a bachelor's degree. Their career services office provides information on employment partnerships in South Dakota, and academic advisers assist learners interested in transferring their degrees to four-year colleges or universities. Every student at Southeast Tech can apply for the Build South Dakota Scholarship program to either earn a full-tuition scholarship or partner with an employer who engages directly with the school through Sponsor A Scholar. Companies that participate in the program can apply for the Forward Sioux Falls Build Dakota Grant to receive funds that Southeast Tech matches, adding to financial aid options for learners. Southeast Tech holds accreditation through the Higher Learning Commission as a member of the North Central Association of Colleges and Schools. Many students choose a two-year online degree with the intention of continuing in a four-year program. However, an associate degree can open doors to dozens of salaried career opportunities, particularly in technology and engineering. Based on median mid-career salaries, an associate degree in software engineering is the most lucrative among all majors, earning graduates with 10 or more years of experience around $100,000. Associate degree-holders who major in networks and telecommunications report having the second highest salaries, earning around $97,000 mid-career. In some cases, an associate degree in the right subject may prove to be a better investment than a bachelor’s degree. According to PayScale, the salaries of the two associate degrees mentioned above are higher than more than 100 bachelor’s degree subjects. While all associate degrees cover general education objectives, each program also provides introductory courses in a specific academic discipline — some which prepare students for work immediately and some which prepare students to pursue a bachelor’s. Selecting the focus that best supports your aspirations ensures the best returns from cheap online community college courses. An associate degree in nursing introduces students to fundamentals required for work in the healthcare industry, including anatomy and physiology, biology, and basic nursing skills. Students can pursue registered nurse (RN) licensure and entry-level work immediately upon graduation or continue to a bachelor’s program for further study in the field. Community college business students learn important fundamentals in subjects like accounting, business law, marketing, and human resources. Although an associate degree in business may not open the doors to advanced employment opportunities, graduates can find work in entry-level management positions or pursue a bachelor’s degree with a solid foundation already in place. Cheap online community college classes in criminal justice prepare students to pursue a myriad of opportunities, including training for police work, entry-level administrative careers, or a bachelor’s degree. The curriculum provides foundational knowledge of the judicial process and justice system, typically requiring a capstone research project in the final semester. An associate degree in accounting introduces students to basic principles of taxes, accounting technology and practices, statistics, and financial analysis. A two-year accounting degree prepares graduates for entry-level clerk jobs in bookkeeping, accounting, and auditing. If desired, students can also go on to pursue bachelor’s degrees in accounting, finance, or economics. General education courses combined with classes in childhood development and education methods make up the curriculum of an an early childhood education associate degree. This credential allows graduates to pursue entry-level work at daycares and childcare facilities. Many graduates also choose to pursue an education bachelor’s degree and, ultimately, teaching licensure. An associate degree in social work provides students with foundational knowledge in sociology, public health issues, and social work practice. Most programs require a final research capstone or internship. Graduates are adequately prepared for entry-level administrative jobs in social work settings as well as bachelor’s programs in social work or related fields. Psychology associate degree holders may find it difficult to enter work in the field, as even entry-level psychology occupations generally require the completion of a bachelor’s. Graduates may qualify for administrative jobs in social work or human services, however. The associate degree curriculum consists of introductory courses in human development, personality, and psychological disorders. Having completed courses in medical law, billing procedures, and management principles, graduates of a healthcare administration associate program may find work in administrative or entry-level management positions in healthcare settings like clinics, nursing homes, and doctor’s offices. Pursuing a bachelor’s in healthcare administration opens doors to more advanced careers. Courses within a computer science associate degree differ depending on the program, as many schools offer concentrations such as web development or information systems management But students generally complete a variety of introductory courses which prepare them for entry-level IT or computing jobs. Graduates can also pursue a bachelor’s in a number of related fields. Associate degrees in paralegal studies require completion of courses in contract law, litigation, legal research and writing, and criminal law. Some programs require completion of an internship or research capstone. Graduates can pursue a bachelor’s in legal studies if desired or find entry-level paralegal work in law firms, government agencies, or nonprofit organizations. One of the major perks of a two-year community college is its affordable tuition. But just how much cheaper is community college than a four-year state college? According to CollegeBoard, the average cost of in-state tuition at a public two-year college in Washington during the 2018-2019 academic year came to $4,440. Comparably, in-state students attending a public four-year university in Washington paid around $9,760 for tuition. Community colleges frequently waive the out-of-state portion of the tuition fee for distance learners, meaning online students can choose from a wider variety of schools while saving hundreds of dollars on tuition. Students pursuing accredited online programs at community colleges are eligible for financial aid, most likely in the form of need-based aid — that which is provided by the federal government and may include grants, federal work-study programs, and loans. The table below will give you an idea of the types and amounts of aid awarded to associate degree students. Perkins Loans act as low-interest federal loans available to part-time students who show exceptional financial need. In order to qualify, students must attend a school that participates in the Federal Perkins Loan Program, and they must complete a FAFSA form online. Pell Grants are available to part-time students who demonstrate financial need; unlike a loan, they do not need to be repaid. The amount of the grant varies depending on a student’s financial need, the cost of tuition, and the student’s academic status (full- or part-time). Many two-year colleges also offer grants to minority students who complete the FAFSA. In order to qualify for federal student aid, online students must meet certain criteria outside of financial need. They must have a high school diploma or GED, be enrolled at an eligible online institution, and should maintain satisfactory grades while in school. Students can find more information at www.studentaid.ed.gov. Online learners at community colleges may also be eligible for scholarships. The National Scholarship Foundation, The Rankin Foundation, and the Women’s Independence Scholarship Program all offer scholarships for students pursuing an accredited two-year degree. Online students should contact the financial aid adviser at their prospective community college to see if they are eligible for scholarships. Students attending even the most affordable online community colleges should consider applying to scholarships to lower their out-of-pocket expenses. Whether you qualify as a low-income, minority, or nontraditional student, or boast high academic achievements and a devotion to community service, you can utilize scholarship opportunities. Explore five examples below. Who Can Apply: This merit-based scholarship welcomes applicants of Hispanic heritage with a minimum 2.5 undergraduate GPA, enrolled at a four-year university or community college with plans to transfer to university. Who Can Apply: Eligible applicants to scholarships from the Jeannette Rankin Foundation include low-income women over the age of 35 pursuing an associate degree, vocational education, or bachelor’s at a regionally accredited school. Who Can Apply: Residents of any U.S. state can apply to this annual scholarship if they plan to pursue a career in business or teaching and are a current high school student, college freshman, or sophomore. Who Can Apply: Applicants must be currently enrolled in a medical assistant program in college or in their senior year of high school. Applicants may submit either a video entry or 500-word essay. Who Can Apply: Every month Unigo.com posts a new $1,500 scholarship opportunity, open to all college students and prospective college students. Scholarships require short, creative essay responses to a prompt. Change careers or career paths? Boost your GPA to transfer into a four year program? Return to school for specialized training? Aside from being wallet-friendly, online community colleges prove highly convenient. Working professionals can complete a two-year online degree around their own schedule and from the comfort of their home. Single parents may find that the time commitment is more feasible when compared to a four-year program. Although community colleges have historically only offered associate degrees to students, a growing number of schools now offer bachelor’s degrees in a bid to stimulate the economy and help students avoid paying hefty tuition fees at public and private colleges. Most bachelor’s programs available at community colleges serve high-need fields such as automotive technology, bio-manufacturing, health information management, and mortuary science. Currently, community colleges across 19 states offer bachelor’s programs. Students planning on pursuing a four-year degree in a specialized area may find that an online community college is the cheapest and most convenient option. The Accrediting Commission for Community and Junior Colleges (ACCJC), Western Association of Schools and Colleges represents one of seven regional accrediting commissions in the U.S. ACCJC accredits associate degree-granting institutions in the West in order to provide assurance to the public that they meet certain standards. Students can visit the ACCJC Directory of Accredited Institutions. Prospective students can visit FinAid to learn more about scholarships, loans, grants, and other types of financial aid that may be available for them. Students must fill out The Federal Application for Federal Aid (FAFSA) to see whether they are eligible for student financial aid. They are encouraged to file their FAFSA forms the day they become available online, January 1, as financial aid is typically available on a first-come, first-serve basis. The American Association of Community Colleges is the leading national organization for community colleges. Students can visit its website to find an online database of AACC’s member community colleges and profiles of each school, including enrollment rates and student characteristics.